June 1922 San Francisco Merchants. 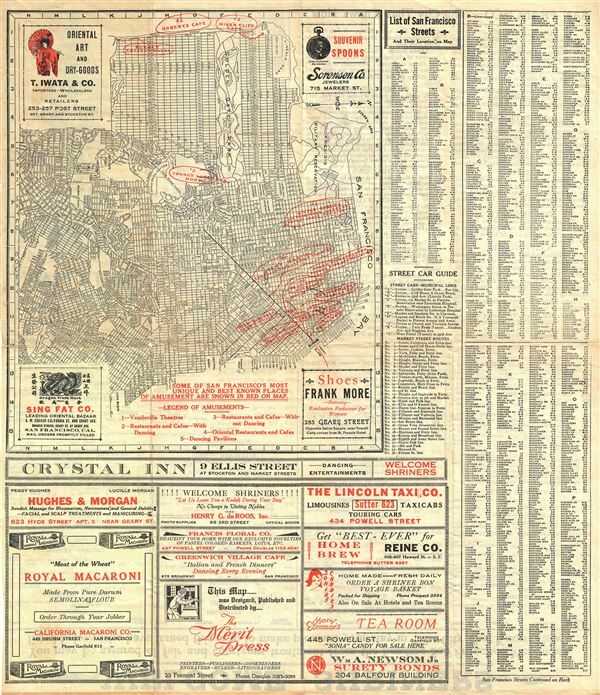 City Map Street Car Shopping and Amusement Guide. This is a fine 1922 map or plan of the city of San Francisco, California, issued by the Merit Press. The map, oriented to the east, covers from Presidio Military Reservation (Presidio Park) south as far as India Basin. It shows all major streets, piers, parks, railway lines and other important landmarks. As noted on the map, 'Some of San Francisco's most unique and best known places of amusement are shown in red.' Local advertisements are included in the four corners of the map, as well as on the bottom of the sheet, under map proper. A list of San Francisco streets is included along the right margin, and is continued on verso. The verso also contains details about the various landmarks of San Francisco and other important tourist information. The illustration and title stating 'Islam Greets You-Glad to Meet You,' and a note welcoming 'Shiners' indicates that this map was issued either for or by the A.A.O.N.M.S. (Ancient Arabic Order of the Nobles of the Mystic Shrine). This map was designed, published and distributed by the Merit Press, 25 Fremont Street. Very good. Minor wear along original fold lines. Some toning, especially near upper left quadrant.